Polar regions are changing rapidly, with the Arctic experiencing the highest levels of warming of any area on the planet. The chemistry of the Arctic Ocean is acidifying faster now than at any time in the past 300 million years. The science is led by the University of Exeter’s Dr Ceri Lewis and Plymouth Marine Laboratory’s, Dr Helen Findlay who are travelling to the Arctic later this month. 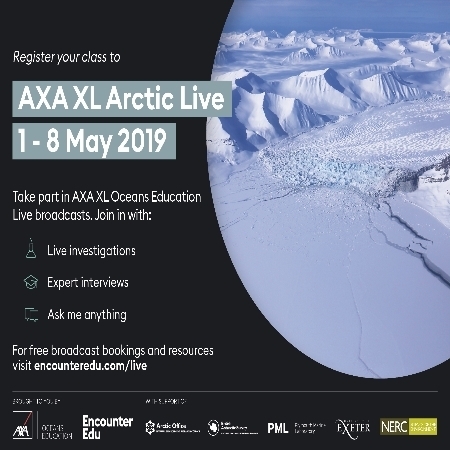 The free live broadcasts are being hosted by Encounter Edu from the high Arctic island of Spitsbergen as part of AXA XL Arctic Live bringing the front line of environmental change to classrooms worldwide. Arctic Live offers thousands young people a portal through which to explore the issues and news headlines about climate change via direct engagement with leading scientists. Dr Lewis is gathering data to understand how much plastic is in the Arctic and its origins. ‘With an estimated 5.25 trillion pieces of micro-plastic in the oceans, the Arctic is a potential sink for small plastic particles that have been transported from the oceanic gyres’, said Dr Lewis. Ocean acidification caused by increased levels of carbon dioxide emitted into the atmosphere is the subject of Dr Findlay’s research as it can affect the growth and reproduction of sea creatures. ‘The polar oceans are acidifying faster than any other ocean’, said Dr Findlay. ‘Ocean acidification can subtly affect many animals but especially impact those that produce a calcium carbonate structure or shell, such as clams. To put it simply, more acidity, makes it harder for these organisms to form shells and puts their long-term survival at risk’. Running from May 1st - 8th, the 25 interactive broadcasts will be hosted by Encounter Edu founder and polar educator, Jamie Buchanan-Dunlop. Encounter Edu’s live steaming education broadcasts have built tremendous new interest in the oceans with its programs reaching 4.6 million students since 2012. Arctic Live was set up by AXA XL and Encounter Edu. ‘Running for a sixth year, Arctic Live is an innovative way to engage young people at scale’, said Chip Cunliffe, Director of Sustainable Development at AXA XL. ‘It forms part of AXA XL Oceans Education’s mission to ignite young people’s curiosity for the natural world, inspiring future STEM careers and engaging in environmental stewardship’.